Getting up at 5:00 AM is never fun. It’s a little easier when you know you’ll be running wild through the woods with a map and compass, though. So I hopped into the Virtus-Van and picked up the one and only Bob Jenkins at 5:30, and we then headed off to Hawn State park for the Gateway Grunt Orienteering Race. I’m so used to sprinting to the registration table right before the start of a race, that it never even bothers me anymore if we’re running a little late. Bob, however, gets a wee bit nervous if we’re running behind. At last year’s Bonk Hard Chill, I thought Bob was going to have a heart attack when we had to drive 70 mph in a 30 mph zone just to make it to the start of the race in time. Believe it or not, though, on this day we were actually early – definitely a first for Team Virtus. We paid the entry fee, signed our lives away on the waivers, and received our race numbers and SI Sticks (An SI stick is an electronic punch instead of a mechanical one). Bob gladly shows us what an SI Stick looks like. One thing I’ve noticed at Orienteering events is that it seems sort of clique-ish. I’ve pretty much felt like an outsider at every orienteering event I’ve ever done. At adventure races and mt. bike races, it seems like everyone is there to have a great time and everyone is laid back and easy going. At O-races, though, it seems like everyone is out for blood. It’s kind of weird. I mean, everyone is nice enough, and they’ll speak to you if you initiate the conversation. It’s just sort of awkward conversation. We did have a nice conversation with Jeff Sona from Team Alpine Shop, though, and he seemed like a genuinely nice guy. He has an adventure racing background, though, so maybe that’s why he seemed more like our type of guy. Anyway, we finished checking in and got dressed. I decided to go with shorts and a short sleeve jersey since it was supposed to be so warm. I don’t think we could’ve asked for better weather for race day. The day started a little cloudy with temps in the low 40’s, and as the day wore on, the sun would shine and the temps reached into the upper 50’s. It was simply perfect racing weather. In hindsight, though, I really wish I would have worn long pants – not because of the weather, but because of the brush that shredded my shins and knees. At 9:45, we walked down the road to the start of the Grunt. We received our maps, although we were forbidden to look at them until the start of the race. The race director went over the rules. We were allowed to skip any two of the 26 controls we wanted, and there were three time cutoffs. You had to hit Checkpoint (CP) 10 before 12:00, and you also had to hit CP 20 before 2:00. The final cutoff was at 3:00 when the race ended. We decided to do this race separately, so this would be Bob’s first solo endeavor. I’ll let him tell you about his experience in a future post, though. 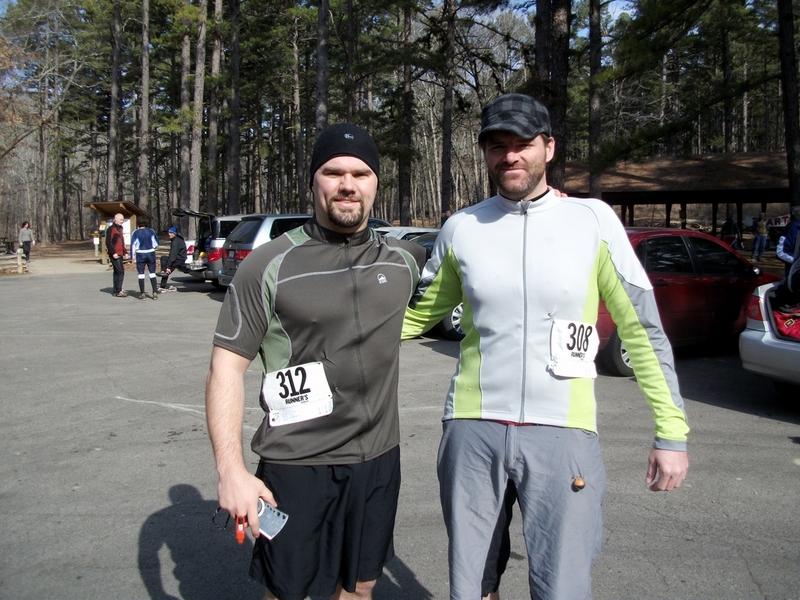 At 10:02, the race director yelled, “Go!” Everyone took off… Except Bob and me and a few others. We were still looking at the map and trying to figure out which way to go. Getting to CP 1 was easy enough. We just had to follow the other 40+ racers. Bob reached #1 slightly ahead of me, and then we headed off for CP 2. Bob took off running at a pretty good clip, and I maintained my “endurance pace” (aka – a really slow jog). I saw Bob heading farther east than I had planned on going. I was about to yell, “Yo, Bob! Where you goin’?” After double-checking the map, though, I saw that there was a trail in that direction that would lead almost right to CP 2. I thought this was a pretty good idea, and I almost followed Bob. I decided to do my own thing, though, and I continued to bushwhack straight to CP 2. I got to #2, and by this time there was no one around me. I didn’t see Bob, and I wasn’t sure if he was ahead of me or behind me. I found CP’s 3, 4, and 5 with no problems. 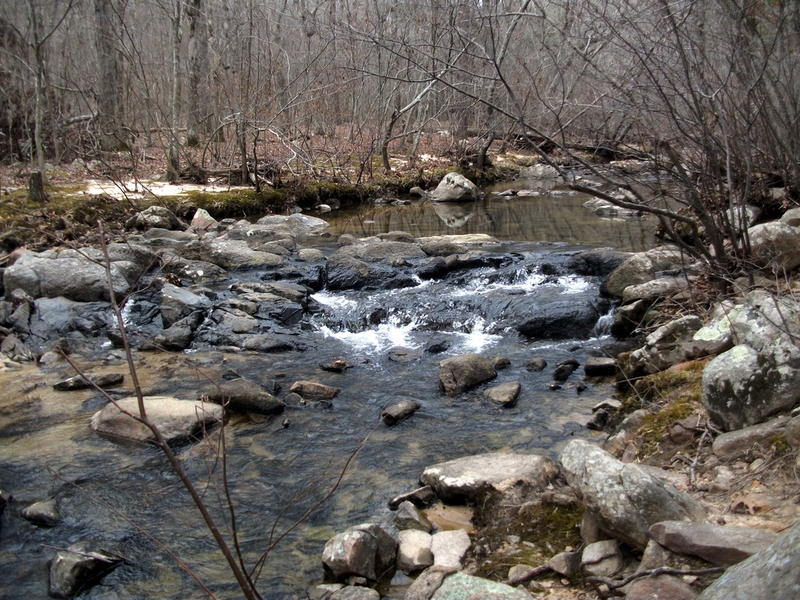 I ran down the trail that skirted alongside the creek for awhile, and I realized how beautiful Hawn State Park is. On my way to CP 6, I saw several racers on their way back to CP 10. Wow. Those dudes were fast. I found #6, and I found #7 which was a water drop. I slammed some Gatorade and water and ate a couple of cookies. I didn’t stay long since the 12:00 cutoff was looming over my head. CP’s 8 and 9 were not a problem, but it was getting close to noon. As I neared CP 10, someone doing the Runt (the shorter version of the Grunt) asked me where I thought we were. For some reason he had to cut his race short, and he wanted to head back to the parking lot. After showing him where I thought I was, he took off towards the parking lot. I then somehow managed to walk right by #10. I soon realized my mistake and found the CP shortly thereafter. CP’s 11 and 12 were found fairly easily, but it seemed like it was taking me forever to get to each CP. I found CP 13 (another water drop), and I slammed some more Gatorade and water. I really wanted to save my two skips until later in the race when I’d be worn out, but I knew that I wasn’t going to get to CP 20 by 2:00 if I didn’t use my skips soon. On my way to CP 20, I heard some rustling in the leaves behind me. Was it Bob sneaking up on me? Nope. It was an armadillo scurrying away from me. It was the first armadillo I’ve ever seen in the wild (other than dead ones on the side of the road). I tried to follow the guy for a little bit, but he magically disappeared. I turned around and headed towards #20 again. I got to where I thought the control was, but I couldn’t find it. I headed down to the creek to try to figure out where to go. It was obvious that I was in the right place. I headed back to where CP 20 should have been. No luck. I headed up and down the creek two more times. Nada. I was getting pretty damn frustrated at this point. It was now a little after 2:00, so I was technically past the cutoff time. By this time, though, it was personal. There was no way I was not going to find this stupid checkpoint 20. I decided to find CP 21 and work backwards. I found #21 easily (although I did not e-punch 21 at this time), and headed backwards to CP #20. When I found #20, I couldn’t believe it. I seriously don’t know what the hell happened. I must have walked by this thing at least 3 times, but I never saw it. It had to be The Curse of the Armadillo! The stupid armadillo distracted me, cursed me, and then disappeared. I know that’s what happened. It’s the only logical explanation. 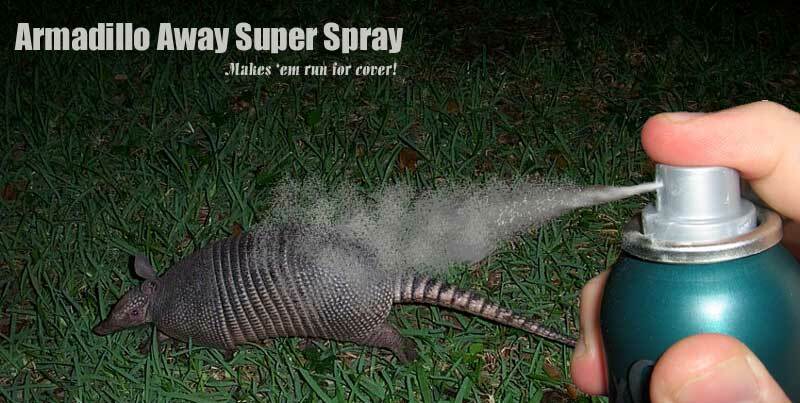 I'm taking some of this on my next race... Stupid Armadillo! I went back to CP 21, the final water drop, and I drank some more water and Gatorade. I found CP 22 easily, and I headed out for CP 23. I knew I wasn’t going to get all of the CP’s in time. I wanted to make sure that I finished before 3:00 so that I would not be disqualified. As long as I finished before the final cutoff, I would get credit for finishing the race. I would just be ranked according to how many CP’s I got (which means probably last, but the results haven’t been posted yet). I skipped CP’s 23-26 in addition to the two earlier skips that were allowed. So it wasn’t a great performance for me. The park was beautiful, the weather was perfect, and I got to practice my orienteering. So it was a great day even though I would’ve liked a better finish. I heard that the winning time was something like 77 minutes which just blows my mind. That’s ridiculous! (UPDATE: the winner of the RUNT finished in 77 minutes, and the winner of the GRUNT finished in 110 minutes – still unbelievably fast!) I’ll just keep plugging away at losing weight, getting faster, and getting better at orienteering. Next time we do something like this, you should really come. It’s always fun, and you can’t help but get better. Just be sure to avoid all armadillos. Stupid armadillos! UPDATE #2: My “Official” finish was 34th out of 35 competitors, but it’s pretty clear that they screwed up my results… They had me with a finishing time of 140 minutes when my actual finishing time was 295 minutes, and they had me finishing with a total of Zero CP’s when I actually got 20 CP’s. So that should have put me 31st place out of 35 racers. I’m not going to contest the results or anything since it clearly doesn’t matter, but I just thought I’d let you all know. 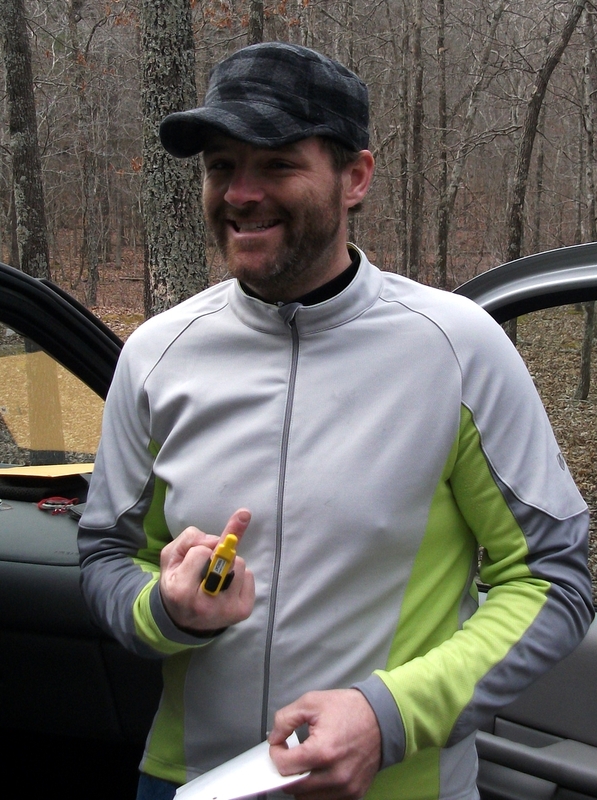 Posted on March 9, 2010, in Race Reports and tagged Gateway Grunt, hawn state park, map and compass, Orienteering Race. Bookmark the permalink. 4 Comments. Dragon, Great job…. Its not always about the win… You cannot compare yourself to others … Focus on you , your goals , and you cant go wrong… Just keep getting better and going longer.. Jeff Sona is a great guy to talk to and learn from… Looks like you and Bob will need to buy new clothes… Congrats and keep up the good work..
Sasha, you’re exactly right. It’s not always about the win (if it was, I don’t think I’d ever enter any events because where’s the fun in that?) Thanks for the words of encouragement. Seriously, it means a lot coming from someone other than family. Good luck at 24 hours of Syllamo! Hey, Luke! Is that some abs I see hiding under that loose, loose jersey??? Looking good! From you and Bob’s posts, I know Hawn Park needs to be a destination. Susy, if you see abs under that jersey, then you must have x-ray vision. You’re too kind, but I’ll take all the compliments I can get. Great job on the race! It sounds like it was a painfully good time. I wish we could have gone. I just sent you an email, so be sure to get back to me when you get a chance.